When the Greens and Labour and launched their radical power proposal last week, it did not take long for them to attract condemnation. As was to be expected, both the government and lobby groups quickly rejected the idea of introducing a single-buyer model out of hand. If there was anything surprising about this at all, it was only the strong language used. Prime Minister John Key labelled the policies “barking mad.” Economic Development Minister Steven Joyce accused the opposition parties of planning a “Soviet-style nationalisation” of the energy sector. BusinessNZ boss Phil O’Reilly was equally clear in his condemnation of the plans by labelling them “economic vandalism”. Meanwhile, on the other side of politics, support for the plans was equally resolute. Commentator Bernard Hickey rejoiced over the opposition’s war on “the power barons”, while former Labour Party president Mike Williams called it “a masterstroke” – precisely because it “effectively sabotages” the government’s asset sales scheme. The only voice offering a nuanced view was Simon Mackenzie, the chief executive of Vector. Speaking to The New Zealand Herald, he said that the proposed model had its pros and cons. Stressing that he was not taking political sides, Mackenzie noted that the Greens/Labour proposal could be made to work and that similar approaches had been tried in other jurisdictions. Among the heated debate triggered by the policy announcement, it was refreshing to hear Mackenzie’s cool-headed assessment. Looking at the Greens/Labour plans sine ira et studio, they may not be an ideal policy option at all. Undoubtedly, making such a bold announcement out of the blue is not the best way of conducting economic policy. Apart from that, it sets a dangerous precedent for dealing with property rights. On the other hand, the economic motivation behind the proposals is easy to understand. Of course, rising power prices are a genuine concern, especially for people on lower incomes. Having said that, New Zealand consumer electricity prices are not unusually high by international standards. Leaving the emotive language aside, will the opposition’s plans actually work? Will they achieve the stated goals of providing secure and more affordable energy to New Zealanders? And what are the potential side effects? It should be noted that the power proposals are not quite as outlandish as they may first appear. A number of Eastern European countries have also implemented single-buyer schemes where all wholesale electricity is purchased by a government authority before being sold on to distributors. However, in the Eastern European cases this market arrangement followed from a completely nationalised energy sector as a step towards liberalisation. In New Zealand’s case, however, it is a move in the opposite direction. Nevertheless, other countries’ experiences with the single-buyer model may help to shed some light on the desirability of this approach. Although there are certain theoretical advantages, on balance they are outweighed by the drawbacks. On the plus side, a single buyer can more easily match physical electricity generation to demand. Such schemes also allow governments to regulate markets effectively because they have direct control over both prices and capacity. After all, this is why the Greens and Labour are proposing their scheme. But it is precisely this strict control by the government over the market that is the greatest disadvantage of the single-buyer model. The core problem, as with other centrally planned regimes, is that it decouples economic incentives from decision makers. This means that the proposed new Crown entity tasked with deciding on the right capacity for electricity generation does not itself bear the consequences of over- or underinvestment in the industry. 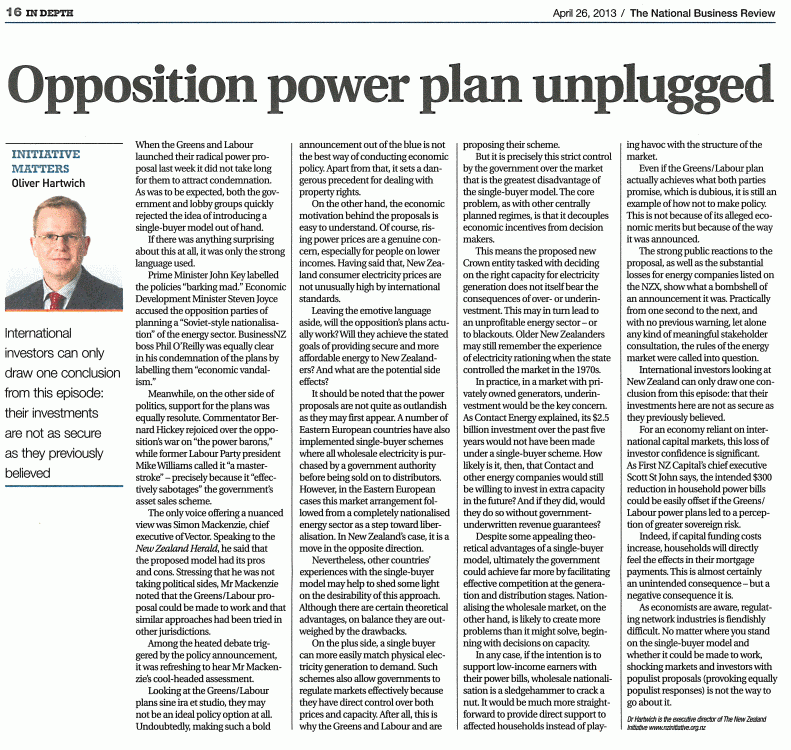 This may in turn lead to an unprofitable energy sector – or to blackouts. Older New Zealanders may still remember the experience of electricity rationing when the state controlled the market in the 1970s. In practice, in a market with privately owned generators, underinvestment would be the key concern. As Contact Energy explained, their $2.5bn investment over the past five years would not have been made under a single-buyer scheme. How likely is it, then, that Contact and other energy companies would still be willing to invest in extra capacity in the future? And if they did, would they do so without government-underwritten revenue guarantees? Despite some appealing theoretical advantages of a single-buyer model, ultimately the government could achieve far more by facilitating effective competition at the generation and distribution stages. Nationalising the wholesale market, on the other hand, is likely to create more problems than it might solve, beginning with decisions on capacity. In any case, if the intention is to support low-income earners with their power bills, wholesale nationalisation is a sledgehammer to crack a nut. It would be much more straightforward to provide direct support to affected households instead of playing havoc with the structure of the market. Even if the Greens/Labour plan actually achieves what both parties promise, which is dubious, it is still an example of how not to make policy. This is not because of its alleged economic merits but because of the way it was announced. The strong public reactions to the proposal, as well as the substantial losses for energy companies listed on the NZX, show what a bombshell of an announcement it was. Practically from one second to the next, and with no previous warning, let alone any kind of meaningful stakeholder consultation, the rules of the energy market were called into question. International investors looking at New Zealand can only draw one conclusion from this episode: that their investments here are not as secure as they previously believed. For an economy reliant on international capital markets, this loss of investor confidence is significant. As First NZ Capital’s chief executive Scott St John says, the intended $300 reduction in household power bills could be easily offset if the Greens/Labour power plans led to a perception of greater sovereign risk. Indeed, if capital funding costs increase, households will directly feel the effects in their mortgage payments. This is almost certainly an unintended consequence – but a negative consequence it is. As economists are aware, regulating network industries is fiendishly difficult. No matter where you stand on the single-buyer model and whether it could be made to work, shocking markets and investors with populist proposals (provoking equally populist responses) is not the way to go about it.